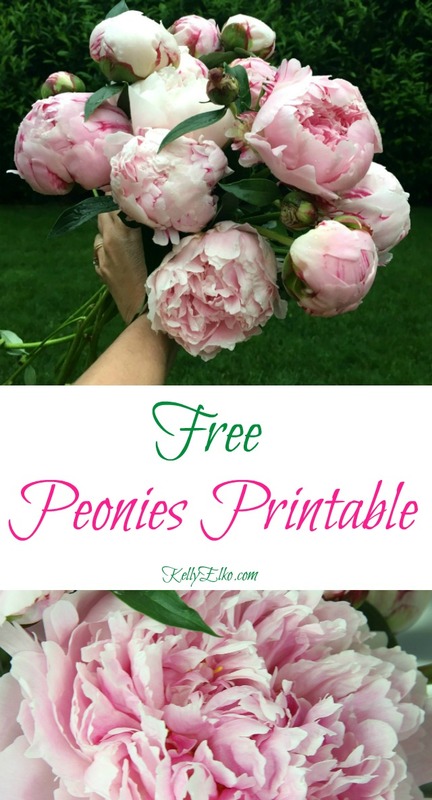 Peonies Envy and Free Peony Printables! This is what I wait 50 weeks of the year for – an explosion of peonies! I planted three peony bushes two years ago (read my Peony Planting Tips here) and they reward me with armloads of blooms every spring. I can’t get enough of these stunners and I love clipping them and giving to friends! Since they are so fleeting, I decided to capture a huge, freshly cut bouquet straight from my garden in a photo so I can enjoy my peonies all year long. Print at Home – set to print 8″ x 8″. they use premium card stock and you can even frame it (I chose a white frame) and choose from a variety of sizes! 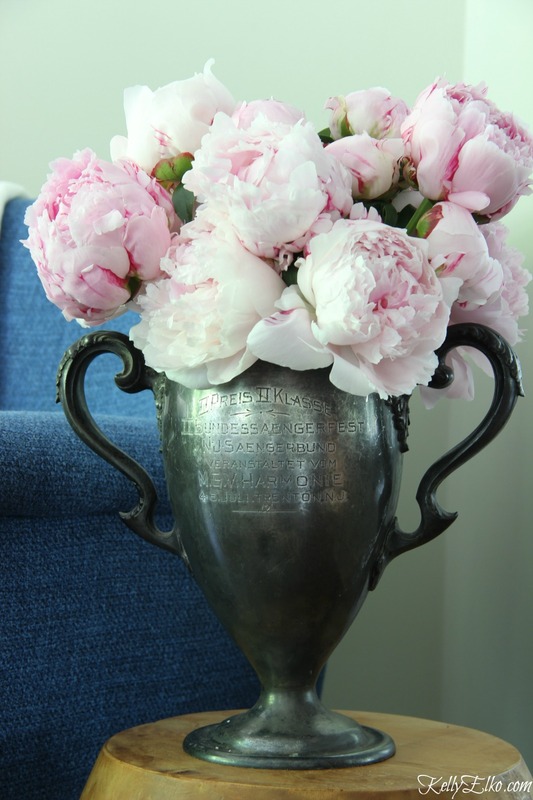 And the trophy goes to … my peonies! 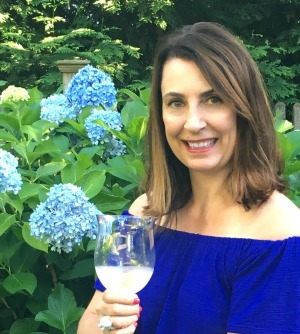 While I wait for my framed art print to arrive, you can find me here in my new blue chair from HomeGoods admiring, inhaling and worshipping my peonies (as the laundry and dirty dishes pile up)! Can you believe I came across a mail order peony site where a dozen flowers was $120! If you’re lucky enough to live in a zone where you can plant your own, I encourage you to do so. 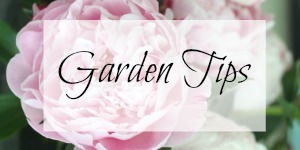 Read all my tips and tricks for planting success. 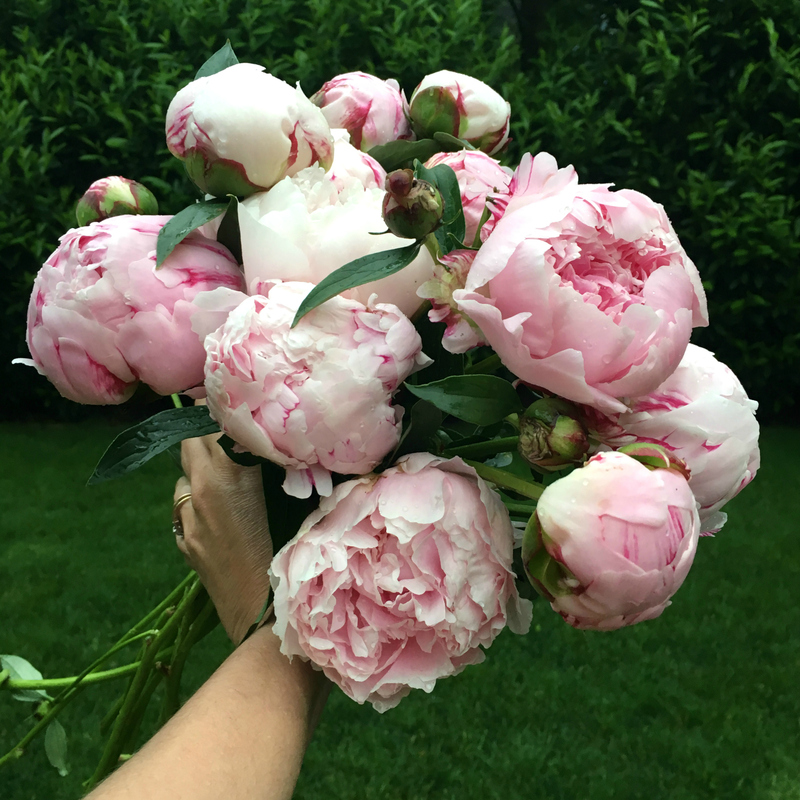 If you have peonies, what’s your favorite variety? I’m thinking of planting a few different colors this fall so I’d love to hear. « Previous: Seasonal Decor Changes and a Giveaway! I too crave the day the peonies bloom. But it’s quickly followed by disappointment since EVERY year, I have a written in stone commitment, one week, out of state. I come home to a lovely carpet of pink and white petals in my garden. I have to leave it to my imagination and enjoy peonies from afar. Oh no Marilyn! I would clip some before you leave – when they are starting to open. Put them in a vase and they should be in bloom when you get home! My family said that years ago they would cut the peonies when they were just at the start of opening up, wrap in newspaper and put in the refrigerator. Then on Memorial Day week they were brought out of the refrigerator to be used on the families graves and the peonies would fully open. I think it would be worth a try if you are missing your blooms anyway. Over the top gorgeous!….Definitely planning to plant peonies in the future “right sized” home! You had me at that peony filled trophy!!! Peonies are a must Shirley! Wish you could smell them! I want a bush and its on my list. 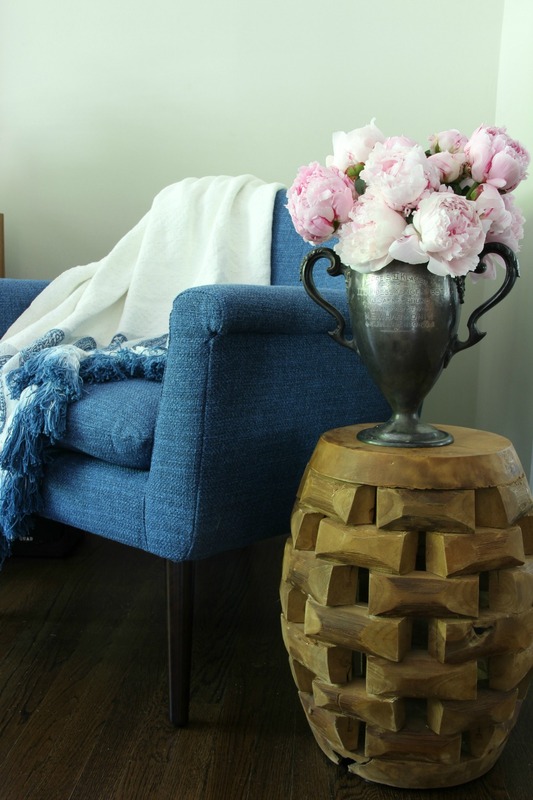 Love your peonies and your pretty blue chair. 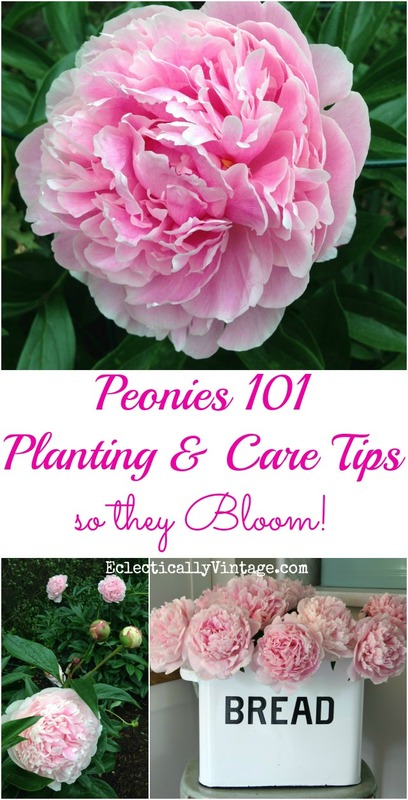 You will wonder how you lived without peonies Marlene! they are beautiful. i wish i grew some of them in my garden, may have to think about it. You need them – plant some this fall! I adore peonies, too, and yours are gorgeous! I have two bushes, one light pink and one darker pink. I’d love to get a bush of that beautiful, rich, dark pink. My husband is a civilian Army employee, but we’ve been mobile and have lived in multiple states and Germany. Whenever we’ve lived where I can plant them, I’ve planted peonies, and others are benefiting from that! When he retires in two years, we’re moving, and I’ll be planting peonies, AGAIN. I feel your pain! I’ve left behind some amazing plants in my two old houses. Glad others get the benefit of your green thumb! They are super gorgeous. I was lucky when I moved into my new house beautiful dark pink and white Peonies. We are lucky to get some in a vase this year before they died out. I am one of those lucky people that benefited from previous owners awesome green thumbs.